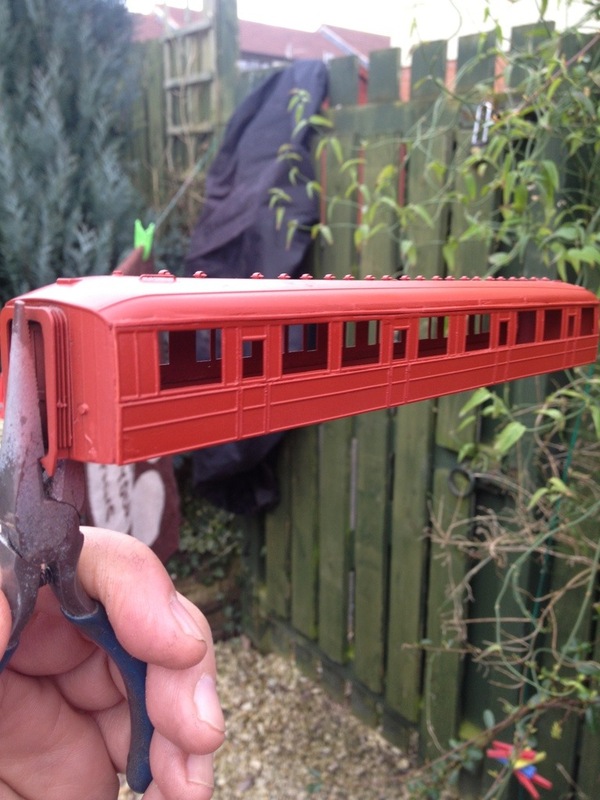 Some progress has been made on the Gresley 61′ TK over the last few days. I hadn’t been overly happy with the gutter area which I threw a lot of filler at before I was satisfied. 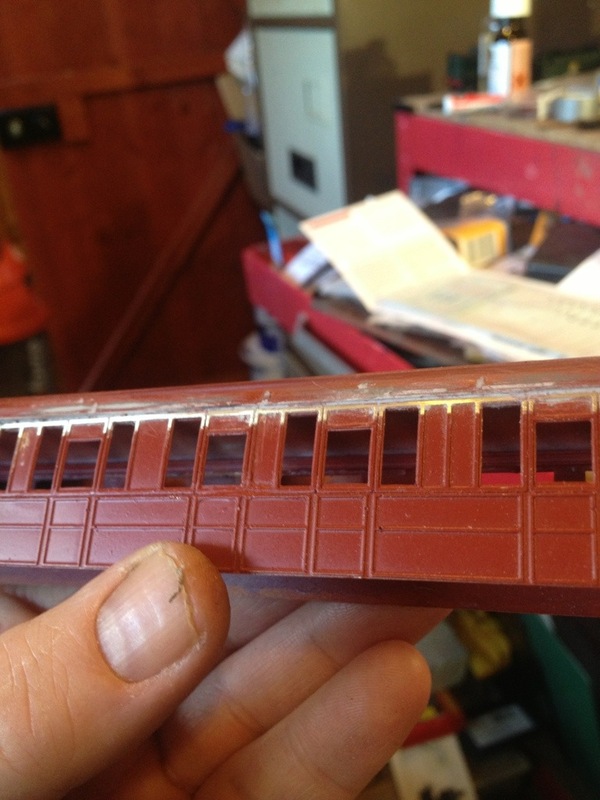 I also restored the continuity of the gutters with Microstrip and although still a bit off perfect, it looked quite reasonable in primer. 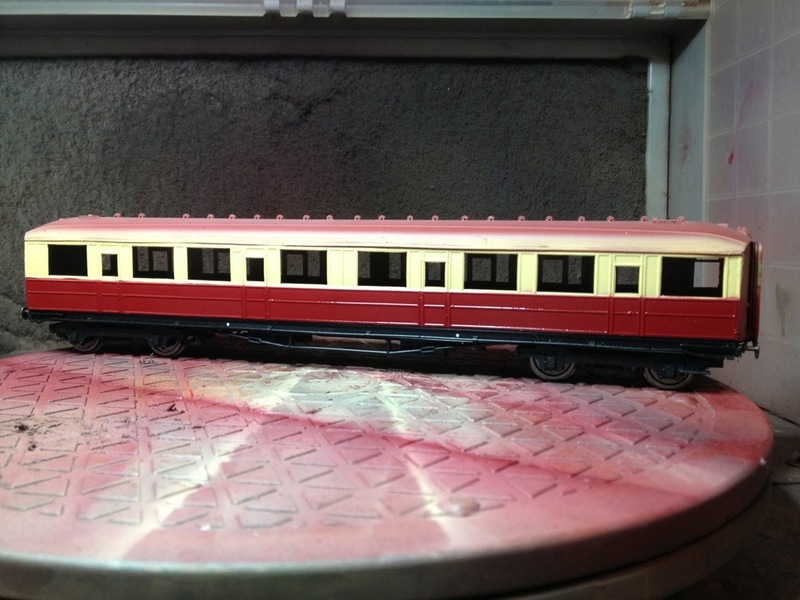 I have now painted the basic livery elements of BR crimson and cream (I’m not getting involved in verbal punch-ups over the correct term for the red component!). I used Railmatch enamel for this. These days although I’m a prolific user of acrylic for most tasks, I do prefer enamels for certain tasks. 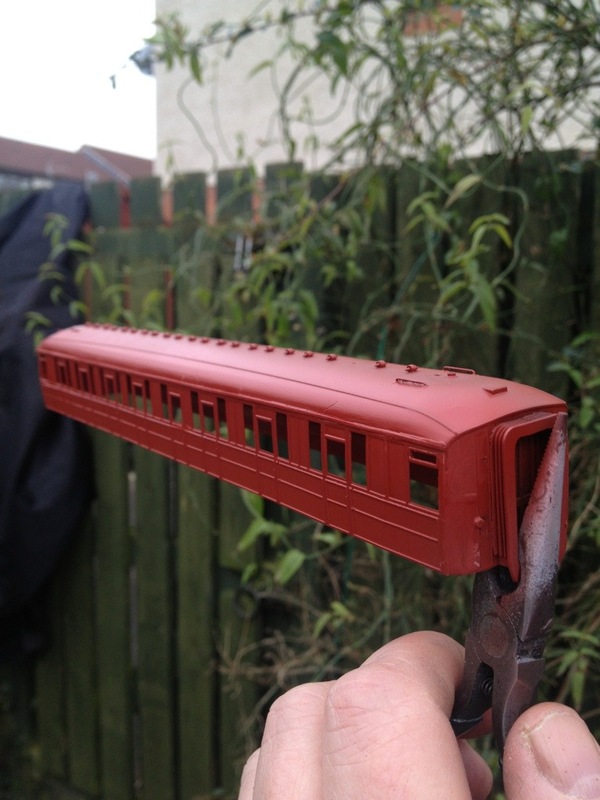 A good durable base coat on a locomotive or coach is exactly the thing I have in mind. The acrylics can be used for the fun effects later! 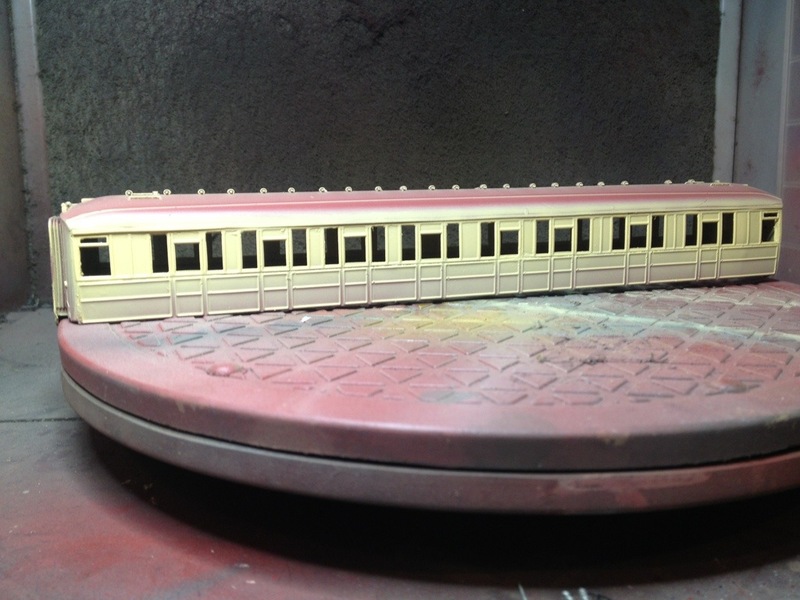 Anyway, the flat surface has been treated to a couple of coats of Klear in preparation for applying the lining and number decals. 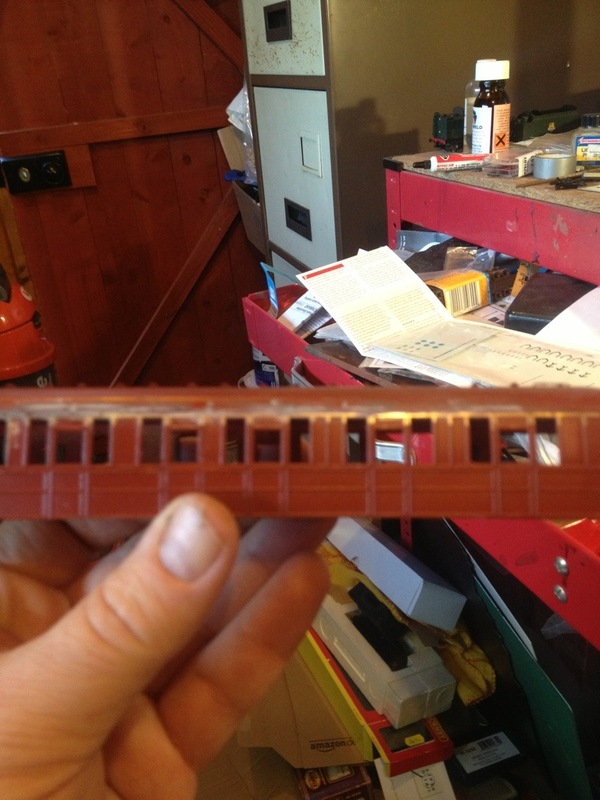 Once I’m happy with those I’ll apply the door handles and grab rails. Sometime in the near future I’ll take care of the interior. I’ll take my cue from the Comet interior diagram. ← The First Tranche, Pt 2. It looks an awfully long coach somehow – think it’s an illusion caused by the relatively small windows. Looking the better for the cream addition – are you looking forward to the lining? I have some CCT coach lining for this job Jamie, so it shouldn’t be too much of a drama. No top lining on these Gresleys as far as I’m aware due to the nature of the design. I understand what you mean about the length. I suppose at 61’6″ these were at the longer end of the scale in terms of general service coaches. Pleasantly surprised with this project. Using the sleeper as the platform probably made the job a bit harder but the brake thirds will be using the BTK as the base which will make life a bit easier in terms of supporting structure and internals. CCT lining is the business – gets a lot of positive attention on my LMS CK. It was the beading that had me wondering – a datum to keep it in line but maybe a faff to bed transfers down over. That should prove rather interesting I’ll admit! Hi Dave, What diagram are you doing. I’ve done a RF and a RTO from MJT sides. 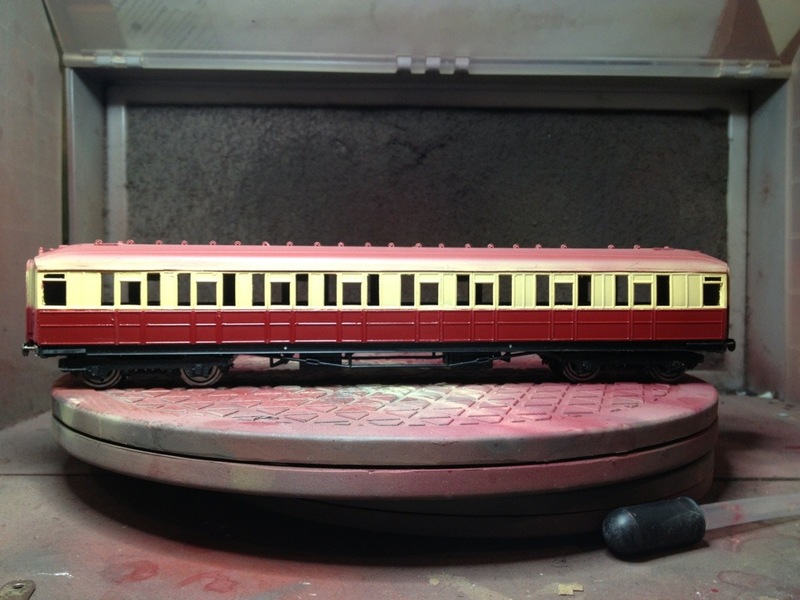 Will you be redusing the width AKA Coachman or not? Personally I’m not sure if I’m going to bother. But still got a lot of under frame details to add, and step boards. Mins nicely pained up in maroon . Finally excuse the barrage of questions but whose masking tape did you use? David, this is being done as a Diagram 130 Composite. I’ve left the solebar narrowing trick too; I think it’s just a bit too complex to be worrying about just yet. I used Tamiya masking tape for the demarcation. It’s not too grippy but it does the job well. I suspect I’ll need to do one or two more of these. All the Carlisle Edinburgh stoppers and semis had one in the formation. I need to do a pile of brake thirds too!